제1도는 본 발명의 실시예의 회로도. First turning the schematic embodiment of the present invention. 제2도는, 제5도, 제7도, 제8도, 제9도, 제11도, 제13도는 실시예의 구체적인 회로도. A second turn, FIG. 5, the seventh degree, the eighth degree, FIG. 9, 11 also, a specific example circuit of claim 13 degrees embodiment. 제3도, 제4도, 제6도, 제10도, 제12도, 제14도, 제15도는 구동파형을 나타낸 도면. The third, the fourth degree, the sixth degree, 10 degree, 12 degree, 14 degree, 15 a diagram showing a driving waveform to turn. 제16도는 실시예의 단면도. Claim 16 degrees embodiment of a sectional view. 제17도는 시험용 소자의 단면도. 17 degrees cross-sectional view of the test device. 제18도, 제19도, 제20도, 제21도는 강유전성 액정의 기본특성도. 18 degrees, 19 degrees, 20 degrees, 21 degrees is also the basic characteristics of the ferroelectric liquid crystal. 본 발명은 액정소자에 관한 것이며, 특히 쌍안정성(雙安定性)을 가진 강유전성 액정(强誘電性 液晶)을 조합한 액정th자와 그 구동방법에 관한 것이다. The present invention relates to relates to a liquid crystal device, particularly bistability (雙 安定性) th liquid crystal character with a driving method combining the ferroelectric liquid crystal (强 誘 電 性 液晶) with. 액정소자는 디스플레이, 광셔터, 편광기(偏光器)등에 사용되고 있지만, 특히 액티브매트릭스 디스플레이는 표시부에 박막트랜지스터(TFT) 등의 스위치소자를 형성하고, 액정 등의 전기광학특성을 가진 물질을 적층한 디스플레이이며, 다주사선이고 고도로 정밀하고, 큰 면적에 사용하는 디스플레이에 적합한 방식이다. The liquid crystal device is a display, optical shutter, but is used like a polarizer (偏光 器), in particular an active matrix display, a display forming a switching element such as thin film transistors (TFT) in the display, and laminating the material with the electro-optical characteristics of liquid crystal, etc. and a scanning line is highly precise, and is suited to a display for use in a large area. TN 액정이나 게스트호스트액정 등 광투과특성이 인가전압의 실효치에 의존하는 액정과 TPT를 적층한 액티브매트릭스를 형성할 경우에는, TFT의 오프저항 R off 이 충분히 크고, 온저항 R on 이 충분히 작으며, 액정자체희 전류리크에 의한 시정수(時定數)가 충분히 클 경우에는, 주사선수가 많은 디스플레이가 형성가능하지만, 상기 각 파라미터중 하나라도 불충분한 것이 있으면 특성이 양호한 디스플레이를 형성할 수 없다. In the case of forming a TN liquid crystal or a guest host liquid crystal or the like light transmitting property is a liquid crystal and an active matrix by laminating the TPT which depends on the effective value of the applied voltage is sufficiently off-resistance R off of the TFT is large, and was on-resistance R on is small enough , when the time constant (時 定 數) by the liquid crystal itself diluent current leak is sufficiently large, the number of scanning lines is possible to form a large display, however, if there is insufficient any of the respective parameters can not be formed having good characteristics display . TN 액정 등, 표시상태가 인가전압의 실효치에 의존하는 액정을 사용한 액티브매트릭스 디스플레이의 구동특성은 본 발명자들이 1983년, 일본국 텔레비전학회 전국대회 예고집(豫稿集) 121-122 페이지에 발표되어 있다. TN liquid crystal, the display state is the drive characteristics of an active matrix display using a liquid crystal which depends on the effective value of the applied voltage is the present inventors published in 1983, the Japanese TV Society National Conference Preliminary (豫 稿 集) page 121-122 have. 이 결과를 보면, 박막트랜지스터(TFT)등의 스위치소자의 오프저항 R off 을 파라미터로 하여 액정층에 인가되는 전압파형을 계산하면, 표시가능한 조건은 선택전압의 실효치 V s , 비선택전압의 실효치 V ns 로 하여V s ＞V ns 이며, 스위치소자의 오프저항이 클수록 앙호한 표시특성이 얻어진다는 것을 알 수 있다. In this result, a thin film transistor (TFT) when the off-resistance R off of the switching element, such as a parameter calculating the voltage waveform applied to the liquid crystal layer, visible conditions of the selection voltage effective value V s, the effective value of the non-selection voltage and to V s> V ns ns to V, it can be seen that the greater the off-resistance angho a display characteristic of the switching element thus obtained. 그러므로, TN 액정을 액티브매트릭스 디스플레이에 사용할 경우에는 스위치소자의 오프저항 R off 을 충분히 크게하는 방향으로 개량되고 있다. Therefore, when using the TN liquid crystal in the active matrix display it has been improved in the direction in which a sufficiently large off-resistance R off of the switching element. 그러나, 예를 들면 디스플레이를 조명하기 위한 광원의 광작용에 의해 TFT 소자의 오프저항이 저하되어버리는 현상 등이 알려져 있다. However, for example, there are phenomena such as discarding the off-resistance of the TFT element decreases known by the optical action of the light source for illuminating the display. 이것에 대해, 비정질실리큰 TFT에서는 채널부에 입사하는 광을 차단하기위한 금속막을 적층하는 방법이나, 다결정실리콘 TFT에서는 소자구조를 바꾸는 방법 등에 의해 오프저항 R off 을 크게 유지하는 것이 제안되어 있으나, 소자의 제조공정이 복잡해진다는 것, 또는 강렬한 광에 대해서는 오프저항 R off 의 저하를 피할 수 없을 정도로 액티브매트릭스용의 스위치소자의 특성으로서 충분한 것이라고는 할 수 없는 현상이다. On the other hand, the amorphous silica large TFT in, but is proposed a method of laminating metal film for blocking light incident on the channel section or, in the poly-Si TFT largely maintain the off-resistance R off by a method of changing a device structure, that is the production process of the device is complicated, or an intense light to said sufficient characteristics as a switching element for active matrix beyond avoiding the lowering of the off-resistance R off is for no symptoms to. 또, 액정자체가 메모리성을 가진 강유전액정이 클라크(NA Clark) 등에 의해 발표(Applied Physics Letter 36(11), 899-901 페이지, 또는 Molecular Crystal ＆ Liquid Crystal Vol 94, 213∼234 페이지, 또는 일본국 특개소 56-107216호 등)되어 있으나, 실제의 디스플레이에 응용하는 경우의 검토는 충분하다고 할 수 없다. Further, the ferroelectric liquid crystal is a liquid crystal with a memory property itself Clark (Clark NA) released by (Applied Physics Letter 36 (11), 899-901 pages, or Molecular Crystal & Liquid Crystal Vol 94, 213~234 page, or Japan Patent No. 56-107216 portion but is like), reviewed the case of application to an actual display may not be sufficient. 본 발명의 목적은 쌍안정성을 가진 강유전성 액정을 액티브매트릭스에 사용하여, 다주사선이며 정보량이 많은 액정소자를 구성하기 위한 소자구성 및 그 구동방법을 제공하는데 있다. An object of the present invention using a ferroelectric liquid crystal with bistability in the active matrix, the scanning line is configured to provide a device and a driving method for configuring a large amount of information is a liquid crystal element. 본 발명은 강유전성 액정에 발견되어 있는 메모리특성, 나아가서는 본 발명자가 실험에 의해 발견한 여러현상을 이용하여, 액티브매트릭스 액정소자 및 그 구동방법을 구성하는 것이다. The invention further memory characteristic that is found in a ferroelectric liquid crystal, is that the inventors using various phenomena found by experimentation, configure the active matrix liquid crystal device and a driving method thereof. 상기 목적을 달성하는 본 발명의 액정소자의 구동방법의 제1의 특징으로 하는 것은 표시전극간에 쌍안정성을 가진 강유전성 액정을 협지하여 이루어지고, 복수의 주사전극과 복수의 신호전극과의 각각의 교점에 스위치소자를 설치하고, 상기 각 스위치소자와 상기 표시전극의 한쪽과의 접속점에 제어소자를 설치한 액정소자의 구동방법에 있어서, 상기 스위치소자가 오프일 때 파고치(波高値)의 절대치가 상기 강유전성 액정의한 계치( |V th | ) 미만으로 유지되는 전압을 상기 강유전성 액정에 인가하고 상기 스위치소자가 온일 때 파고치의 절대치가 상기 한계치( |V th | ) 미만인 제1의 전압신호를 상기 강유전청 액정에 인가하여, 광투과상태를 유지시키고 상기 스위치소자가 온일 때 파고치의 절대치가 상기 한계치 ( |V th | ) 이상인 제2의 전압신호를 It is characterized by a first drive method of a liquid crystal device of the present invention to achieve the above objects is made by sandwiching a ferroelectric liquid crystal having the bistability between the display electrodes, a plurality of scan electrodes and the plurality of each intersection of the signal electrode a switch device for, and the absolute value of each of the switching elements and the display in the driving method of a liquid crystal device to install the control element to the connection point of the one side and of the electrodes, the switching elements is peak-value (波 高 値) when off above gyechi of the ferroelectric liquid crystal (| V th |) the absolute value of applied voltage that remains in the ferroelectric liquid crystal is less than the wave height when the switch element is on the threshold value (| V th |) is less than the voltage signal of the first the voltage signal of the second or higher is applied to the ferroelectric liquid crystal to blue, maintaining the light transmitting state and the absolute value of wave height when the switch element is on the limit values (| | V th) 기 강유전성 액정에 인가하여, 광투과상태를 변화시키는 단계로 이루어지는 것에 있다. It is applied to the ferroelectric liquid crystal group, and being made of a step of changing the light transmitting state. 본 발명의 액정소자의 구동방법의 제2의 특징으로 하는 것은 표시전극간에 쌍안정성을 가진 강유전성 액정을 협지하여 이루어지고, 복수의 주사전극과 복수의 신호전극과의 각각의 교점에 스위치소자를 설치하고 상기 각 스위치소자와 상기 표시전극의 한쪽과의 접속점에 제어소자를 설치한 액정소자의 구동방법에 있어서, 상기 스위치소자가 오프일 때 파고치의 절대치가 상기 강유전성 액정의 한계치 ( |V th | ) 미만으로 유지되는 전압을 상기 강유전성 액정에 인가하고 상기 스위치소자가 온일 때 파고치의 절대치가 상기 한계치( |V th | ) 미만인 제1의 전압신호를 상기 강유전성 액정에 인가하여, 광투과상태를 유지시키고, 상기 스위치소자가 온일 때 파고치의 절대치가 상기 한계치 ( |V th | ) 이상인 고정의 값의 제2의 전압신호를 상기 강유전성 액 It is a second aspect of the method of driving the liquid crystal device of the present invention is made by sandwiching a ferroelectric liquid crystal having the bistability between the display electrodes, a switch element in each intersection of the plurality of scan electrodes and the plurality of signal electrodes and wherein in each of the switching elements and drive method of a liquid crystal device to install the control element to the connection point of the one side and at the display electrode, the switching element is off-work the absolute value of wave height threshold value of the ferroelectric liquid crystal when (| V th |) applying a voltage which is kept below the ferroelectric liquid crystal and an absolute value of a wave height when the switch element is on the threshold value (| V th |) is applied to the ferroelectric liquid crystal, a voltage signal at a first lower than, and maintaining the light transmitting state , the switching element, the absolute value is the threshold value when the wave height is on (| V th |) is greater than or equal to the voltage signal of the second value of the fixed ferroelectric liquid 에 인가하여, 광투과상태를 소정의 상태로 하고, 파고치의 절대치가 상기 한계치 ( |V th | ) 이상이고, 또한 상기 제2의 전압신호와는 역극성(逆極性)의 제3의 전압신호를 상기 강유전성 액정에 인가하여, 광투과상태를 변화시키는 단계로 이루어지는 것에 있다. The application to the light transmitting state to a predetermined state, and the absolute value of digging the threshold value (| V th |) or higher, and also the voltage signal of the third of the second voltage signal with an inverse polarity (逆極性) of the applying to said ferroelectric liquid crystal, and being made of a step of changing the light transmitting state. 본 발명의 액정소자의 특징으로 하는 것은 표시전극간에 쌍안전성을 가진 강유전성 액정을 협지하여 이루어지는 액정소자에 있어서, 복수의 주사전극과 복수의 신호전극과의 각각의 교점에 스위치소자를 설치하고, 상기 각 스위치소자와 상기 표시전극의 한쪽과의 접속접에, 상기 스위치소자가 오프일 때 상기 강유전성 액정에 인가되는 전압의 파고치의 절대치가 상기 강유전성 액정의 한계치 ( |V th | ) 미만으로 유지되는 제어소자를 설치하고, 상기 스위치소자는 제어단자가 상기 주사전극에, 한쪽 주단자가 상기 신호전극에, 다른쪽 주단자가 상기 표시전극외 한쪽에 접속되는 3단자스위치소자인 것에 있다. In the liquid crystal device formed by sandwiching a ferroelectric liquid crystal having bistability is between the display electrode, characterized in the liquid crystal device of the present invention, a switch element in each intersection of the plurality of scan electrodes and the plurality of signal electrodes, wherein each switch element connected to ground on one side and at the display electrode, when the switch element off the absolute value of wave height of the voltage applied to the ferroelectric liquid limit of the ferroelectric liquid crystal control is maintained to be less than (| | V th) installing the device, wherein the switch device is to control the terminal to which the three-terminal switch element in the scan electrodes, the one peripheral edge that is self to the signal electrode and the other being connected to one outer peripheral edge self the display electrode. 다음에, 본 발명의 실시예에 대하여 도면에 따라서 상세히 설명한다. Next, it will be described in detail according to the drawings, an embodiment of the present invention. 본 발명은 본 발명자들이 발견한 다음에 기술차는 실험사실에 의거한 것이다. The present invention has been described in the difference found by the present inventors to the following fact based on the experiments. 먼저, 실험소자의 구성에 대하여 제17도에 따라서 설명한다. First, it is described in claim 17 depending the configuration of the experimental device. 액정소자는 투면전극(18)을 가진 유지, 플라스틱 등의 2매의 투명기판(17), PET(폴리에틸렌 테레프탈레이트) 필름스페이서(19), 강유전성(强誘電性) 액정(20)으로 이루어진다. Liquid crystal element is made up of two sheets of the transparent substrate (17), PET (polyethylene terephthalate) film spacer 19, the ferroelectric (强 誘 電 性) liquid crystal 20 in the oil, plastic or the like with tumyeon electrode 18. 투명기판(17)의 한쪽은 포토레지스트와 플루오르화수소산 용액을 사용하여 에칭하고, 제17도에 나타낸 것과 같이 스텝부를 형성해 놓았다. One side of the transparent substrate 17 is etched using a photoresist and the hydrofluoric acid solution, and placed to form a step portion as shown in 17 FIG. 이와 같은 스텝부를 형성하면, 두께가 2rμ 이하의 필름의 입수가 곤란함에도 불구하고, 2㎛ 이하의 갭(gap)의 액정소자를 안정되게 제작할 수 있다. By this same forming step, the thickness can be produced even though the film obtained in the following 2rμ difficult, to stabilize the liquid crystal element of the gap (gap) of 2㎛ below. 강유전성 액정으로서는 제1표에 나타낸 4성분 혼합재료를 사용했다. As the ferroelectric liquid crystal used a quaternary mixed material shown in the first table. 갭은 1.6㎛으로 하고, 투명전극(18)상에는 배향막(配向膜)의 도포, 러빙 등의 표면처리는 일체하지 않았다. Gaps in 1.6㎛, and the application of the transparent electrode 18 formed on the alignment film (配 向 膜), surface treatment such as rubbing was not at all. 다음에, 액정분자의 배향방향을 기술한다. Next, a technique of the alignment direction of liquid crystal molecules. 먼저, 액정상(液晶相)ㆍ등방상(等方相) 전이온도보다 약간 높은 온도(이 경우는 120℃정도)까지 가열하여 일단 등방상으로 한다음, 0.1℃/분 정도로 서냉(徐冷)하여 스맥틱 A상(분자장축이 층면에 수직)으로 했다. First, a liquid crystal phase (液晶 相) and isotropic phase (等 方相) transition slightly higher temperature than the temperature (in this case about 120 ℃) ​​and to one end isotropic phase heated to negative, 0.1 ℃ / min so slow cooling (徐 冷) to have a phase smack tick a (the molecular long axis normal to the layer surface). 이 때. At this time. 액정은 셀측면(액정ㆍ스페이서필름계면)에서의 계면효과에 의해 분자장축이 이 계면에 평행으로 또한 층이 수직으로 줄지으면서 성장해 간다. The liquid crystal is grown goes off the molecular long axis layer is also in the vertical line parallel to the interface by interfacial effects at the cell side (the liquid crystal and the spacer film interface). 드디어, 측정에 충분한 영역에 있어서, 양호한 모노도메인을 형성한다. Finally, in the area sufficient for measurement, to form a good monodomain. 모노도메인 성장과정게 있어서는, 분자장축과 층법선이 서로 수직인 스멕틱 A상을 형성하지만, 다시 54℃ 이하까지 서냉하면, 층의 평면성을 유지하면서 분자장축이 층법선으로부터 경사진 스멕틱C * 상으로 된다. In it monodomain growth process, when the molecular long axis and forms a layer normal is the switch are perpendicular to each other smectic A phase, but slowly cooled again to not higher than 54 ℃, sloping from the molecular long axis layer normal, while maintaining the planarity of the layer smectic C * It is the phase. 본 발명에 있어서 소자에 나선이 소실되어 쌍안정성이 출현하고 있는 것을 다음에 기술하는 관찰에 의해 확인했다. According to the present invention it is a spiral element disappearance was confirmed by the observations described in the following and in that the bistable appearance. 소장에의 인가전압파형과 소자의 광투과율(이하 밝기라고 표현함)의 관계의 측정결과를 설명한다. It will be described the measurement results of the relationship between the light transmittance (as expressed as below brightness) of the applied voltage waveform and the device in the small intestine. 이들 전기광학특성의 측정은 광강도 검출기를 부착한 편광현미겅 직교 니콜프리즘(Nicol prism)하에서 파장이 550nm의 단색광원을 사용하여 행하고 시료온도는 실온 23℃로 했다. Measurement of these electro-optical characteristics under a polarizing microscopic thistle orthogonal Nicol prisms (Nicol prism) attaching the light intensity sensor is performed by using a monochromatic light source having a wavelength of 550nm of the sample temperature it was room temperature 23 ℃. 분자배향의 쌍안정선 때문에 이 액정에서는 전기광학적인 메모리성(본 발명자들은 전계제거 후도 수개월이상 기억하는 것을 확인했음)이 출현하여, 제18도에 나타낸 것과 같이 앞에 인가한 펄스와 역극성의 펄스를 인가했을 때에 비로서 명암(明暗)의 광투과상태가 역전했다. In the liquid crystal due to the binocular choice of molecular orientation electric optical memory property (the inventors confirmed haeteum to remember more than a few months after removal of the electric field) by the appearance, is in front as shown in claim 18 is also a pulse with a reverse polarity pulse to the light transmission state of the contrast (明暗) was reversed as the ratio when applied. 액정에 인가되는 전압의 펄스의 극성을 앞에 인가한 펄스와 동일하게 한 경우는 밝기는 변하지 않는다. If one and the same was applied before the polarity of the voltage pulse applied to the liquid crystal pulse brightness it does not change. 명암의 광투과상태를 완전히 역전할 수 있는 충분한 폭(시간폭을 가리킴)과 파고치(波高値)를 가진 전압펄스를 인가한다음 동일폭으로 역극성의 전압펄스(파고치를 V LC 로 나타냄)를 인가할 경우, V LC 의 절대치가 어떤 값 이하(0도 포함)에서는 광학응답은 일어나지 않는다. A width sufficient to completely reverse the light transmission state of the intensity (indicating the time width) and peak-value by applying a voltage pulse with a (波高値) then (representing the peak value in V LC) voltage pulses of opposite polarity in the same range a case to apply, less than the absolute value of V LC any value (including 0) in the optical response does not occur. 본 발명에서는 광학응답이 일어나기 시작하는 한계치전압을, V LC ＞0틴 경우를 V th (+) , V LC ＜0인 경우를 V th (-) 로 정의한다. In the present invention, the threshold voltage at which an optical response begins to occur, the V LC> If the V th 0 Tin (+), when the LC V <V th 0 - defined as (). 또한. Also. -V th (-) ＜V LC ＜V th (+) 인 전압대를 불감대로 정의한다. -V th (-) <V LC <V th (+) is defined as a dead zone for the voltage. 액정에의 인가전압의 절대치 |V LC |를 V th (+) 이상, 또는 V th (-) 이상으로 하면, 그 전압치가 클수록 밝기 B의 변화량은 크다. Is the absolute value of the voltage of the liquid crystal | V LC | to V th (+) or higher, or V th (-) if the above, the larger the voltage value amount of change in the brightness B is greater. 그러나, 밝기 B에는 포화치 V sat (+) , V sat (-) 가 존재하며, 어떤 전압치이상에서는 전압의존이 없어진다. However, the brightness B is pohwachi V sat (+), V sat - the voltage dependence disappears in the presence, and any voltage value or more (). 제19c도는 제19a도에 나타낸 2개의 전압펄스를 인가한 경우의 밝기(제19b도)의 측정에서 얻은 것이다. The turn 19c is obtained from measurements of brightness (Fig. 19b claim) of the case of applying the two voltage pulses shown in the Fig 19a. 즉, 인가신호중 앞의 전압펄스(파고치 V 1 )로 밝기의 초기치 B o 를 정한다. That is, the initial value is determined sinhojung B o of the brightness in front of the voltage pulse (crest value V 1). 이 때, V 1 이 플러스이고 충분히 크면 밝기의 초기치 B o 는 최대치 B max 이며, 제2의 전압펄스(파고치 V 2 )를 횡축으로 한 그래프(제19c도)에 있어서의 실선(c)의 특성으로 된다. At this time, the V 1 is plus large enough brightness initial value of B o is the maximum value B max, the solid line (c) of the second voltage pulse one (crest value V 2) with horizontal axis graph (No. 19c degrees) It is the property. 또, V 1 이 마이너스이고 충분히 크면, 밝기의 초기치 B o 가 B min 으로 되고, V 1 에 대한 특성픈 제19도(c)중의 파선(a)와 같이 된다. Further, V 1 is minus and sufficiently large, the initial value B o of the brightness is a B min, characteristic for V 1 peun 19 may be as shown in the broken line (a) in (c). 또한, V 1 의 임의의 일정치일 때 밝기의 초기치 B o 가 B b 이면, V 1 에 대한 특성은 제19도(c)중의 1점쇄선(b)와 같이 된다. In addition, when any one of the initial brightness when a certain value of V 1 B o a B b, characteristic for V 1 is as shown in the dashed line (b) of FIG. 19 (c). 또 앞에 기술한 한계치전압 V th (+) , V th (-) 및 포화전압 V sat (+) , V sat (-) 을 제19c도중에 나타낸다. In a threshold voltage V th (+) technology front, V th (-) and the saturation voltages V sat (+), V sat (-) shows the way the 19c. 제19c도에 있어서, 펄스폭 τ은 1ms 일정으로 했다. The 19c is also in, the pulse width τ is made to a constant 1ms. 본 발명자들이 실시예에서 확인한 바, 예를들어 한계치전압 V th (+) , V th (-) 의 양쪽이 모두 초기 상태의 여하를 불문하고 약 4V, 포화전압 V sat (+) , V th (-) 은 약 11V였다. Bar, such as the threshold voltage V th (+), V th of the present inventors confirmed in Example (-), both sides of, regardless of the initial state of about 4V, and the saturation voltage V sat (+), V th ( -) it was approximately 11V. 그리고, 관찰은 (0.5) 2 mm 2 정도의 영역에서 했지만, 이 영역내에 직경이 수 ㎛~수십 ㎛ 정도인 2가지 명암상태의 다수의 도메인이 혼재하는 것으로, 밝기의 중간상태가 실현되어 있었다. Then, the observation is (0.5) 2, but in the region of mm 2 degree, that this can ㎛ ~ multiple domains of the two brightness state tens ㎛ diameter coexist in this area, was intermediate of brightness is realized. 이상의 실험에 의해, 전기광학적인 메모리성과 그것에 대응한 히스테리시스 및 불감대의 존재 즉 V LC 와 B와의 사이의 급준(急濬)한 한계치특성이 확인되었다. According to the above experiment, it was confirmed that electrical and optical memory corresponding one hysteresis and dead zone exists that is steep (急濬) a threshold characteristic between the V LC and B to it. 본 발명에서는 이들 메모리성과 불감대의 존재를 적극적으로 이용하고 있으며, 표시소자, 광셔터소자, 편광소자 등으로서의 기능을 할 수 있다. In the present invention, it is actively used in the memory thereof and the dead band is present, may function as such a display element, an optical shutter device, a polarizing element. 이며 여기서는 5V로 했음)을 반복하여 인가한 경우의 광학응답을 측정했다. And here it was measured for optical response in the case of applying repeatedly haeteum to 5V). 결과를 제20도에 나타낸다. The results are shown in Figure 20. 여기서, 밝기는 그 최대치 B max 로 규격화한 값을 사용하고 있다. Here, the brightness is to use a value normalized with the maximum value B max. 실험결과로부터 알 수 있듯이, 제20a도와 같이 동일 극성의 펄스를 반복하여 인가하면 밝기의 변화가 축적되어 가는 것에 대해, 제20b도에 나타낸 것과 같이 극성을 순차 반전시키면 축적은 일어나지 않는다. As can be seen from the experimental results, when applied repeatedly to the pulse of the same polarity as the help 20a when about going accumulate the change in brightness, successively reversing the polarity as shown in the Figure 20b accumulation does not occur. 이 결과는 밝기를 변화시키고 싶기 않은 화소에 전압을 인가할 경우에는그 전압치를 불감대내로 억제하거나, 불감대를 넘을 경우에도 동일극성의 펄스를 계속하여 인가하지 않을것이 필요하다는 것을 의미하고 있다. This result means that it need not be applied continuously to the same polarity pulse even if a voltage is applied to the pixel that we want to change the brightness, the suppressed value of the voltage to the dead inward or greater than the dead band. 또 하나의 실험에서는, 펄스 폭 τ을 변화시켜 제19도와 같은 전압과 밝기의 관계를 측정했다. In another experiment, by varying the pulse width τ and it measured the relationship between the voltage and the brightness of 19 Help. 그 일예를 제21도에 나타낸다. It shows the example of claim 21. Fig. 퍽스폭 τ을 넓게 해가면 V th (-) , V sat (-) 모두가 낮아진다 이 결과는 제19도중의 3가지 특성(a), (b), (c)에 대해 각각 성립되므로, 펄스폭 τ 변조에 의해서도 구동이 가능하다는 것을 의미하고 있다. Puck mask to widen the seupok τ V th (-), V sat (-) , so low that all the results are each satisfied for the three characteristics (a), (b), (c) of claim 19, during pulse width which means that the drive can be modulated by the τ. 지금까지의 설명은 광이 액정소자의 됫면으로부터 투과하는 것으로 행했지만, 같은 결과는 뒷면에 반사판을 설치한 이른바 반사형 소자로도 성립된다. So far it described, but the line that the light is transmitted from the doetmyeon of the liquid crystal element, the same result is established as a so-called reflection-type element is installed on the back of the reflector. 또, 액정중에 색소를 혼입한 이른바 게스트-호스트형 소자에 대해서도 성립된다. In addition, the incorporation of the dye in the liquid crystal so-called guest-host type is established about the device. 이 경우는 뒷쪽 기판은 투명일 필요는 없다. In this case, the rear substrate is not necessarily transparent. 다음에, 강유전성 액정과 액티브매트릭스를 조합한 디스플레이의 실시예에 대하여 제1도에 따라서 설명한다. Next, a description will be given in FIG. 1 according to an embodiment of the display for a combination of the ferroelectric liquid crystal and an active matrix. 박막트랜지스터 등의 3단자 스위치소자(1) 사이에 협지되는 강유전성 액정층(2), 표시전극(21), (22), 신호전극배선(4), 주사전극배선(5) 및 저항 등의 제어소자(3)에 의해 1화소가 구성된다. Control, such as a ferroelectric liquid crystal layer 2, the display electrodes 21 and 22, a signal electrode wiring 4, the scanning electrode wiring 5 and the resistor held between the three-terminal switching element 1 such as thin-film transistors the one pixel is constituted by an element (3). 이와 같은 화소가 복수의 주사전극과 복수의 신호전극과의 각 교점에 배설되며, 전체로서 액티브매트릭스를 구성한다. Such pixels are arranged in a plurality of scan electrodes and the plurality of each intersection of the signal electrode, it constitutes an active matrix as a whole. 제어소자(3)를 제외한 구성은 종래부터 공지의 액티브매트릭스 디스플레이의 1화소의 구성이다. Configuration other than the control element 3 is a configuration diagram of one pixel of an active matrix display of the conventionally known. 3단자스위치소자(1)의 제어단자는 주사전극(5)에, 한쪽의 주단자는 신호전극(4)에, 다른 쪽의 주단자는 표시전극의 한쪽(21)에 접속된다. 3 the control terminal of the terminal switch element (1) to the scan electrodes 5, the peripheral edge of the sleeping one signal electrode 4, is connected to one side 21 of the display electrodes The peripheral edge of the other. 제어소자(3)는 3단자스위치소자(1)의 다른 쪽의 주단자와 표시전극의 한쪽(21)과의 접속점과, 전위 V cont 와의 사이에 설치한다. Control device 3 is provided between the connection point and, with the electric potential V cont and the three-terminal switching elements (1) one of the other of the main terminals and the electrodes of the display (21). 그리고, 표시전극(22)은 전위 V com 에 접속된다. Then, the display electrode 22 is connected to a potential V com. 본 발명의 특징은 새로 제어소자(3)를 부가하고, 제어소자(3)를 통해 액정층(2)에 콘트롤신호 V cont 를 인가하여 액정의 광투과상태를 제어하는데 있다. Features of the present invention to newly add a control element (3), to the liquid crystal layer 2, the control signal V cont in via the control device (3) is controlling the light transmission of the liquid crystal. 콘트롤신호 V cont 는 외부에서 주사전압 V scan 이다 신호전압 V sig 과 별개로 인가해도, 또 표시부내의 어느 접점의 전압을 이용하여 인가해도 된다. The control signal V cont may be a scanning voltage V scan externally applied separately from the signal voltage V sig, also may be applied using a voltage of any contact of the display portion. 여기서, 제1도의 제어소자(3)의 역할에 대하여 기술한다. Here, a description is made of the role of the first-degree control device 3. 제어소자(3)는 스위치소자(1)가 최소한 오프일때 강유전성 액정(2)에 인가되는 전압의 파고치의 절대치를 강유전성 액정의 한계치( | V th | )미만으로 유지하기 위한 것이다. The control element 3 is the switching element 1 is turned off at least when the ferroelectric liquid crystal (2) the absolute value of wave height of the voltage threshold value of the ferroelectric liquid crystal to be applied to it is to remain below the (| | V th). 강유전성 액정층(2)은 표시상태가 전압(전계)의존성과 메모리특성을 가지고 있으므로, TN 액정과 같히 스위치소자(1)가 오프의 경우에도 액정층의 전압을 유지할 필요가 없다. A ferroelectric liquid crystal layer (2) Since the display state has a voltage (electric field) dependence and memory characteristics, TN liquid crystal and gathi switch element (1) it is not necessary to maintain the voltage of the liquid crystal layer in the case of off. 즉, 표시해야 할 화소가 주사전극(5)에 주사전압이 인가되어, 스위치소자(11)가 온일 때에 스위치소자(1)를 통해서, 신호전극(4)으로부터 신호전압이 액정층(2)에 인가된다. That is, the scanning voltage pixel to be displayed on a scan electrode (5) is applied, the switching element 11 is turned on when the switch element, through (1) the signal electrode 4, the liquid crystal layer 2, a signal voltage from the It is applied. 이 인가전압의 절대치가 불감대폭(V th (-) ,V th (+) )이상의 전압이면 액정층(2)의 상태가 인가전압에 대응하여 결정된다. This is significant, the absolute value of the voltage dead band - when voltage equal to or greater than (V th (), V th (+)) is determined by the state of the liquid crystal layer (2) corresponding to the applied voltage. 그후, 스위치소자(1)가 온으로 되어 액정층(2)에 한계치( | V th | ) 미만의 어떠한 전압이 인가되어도, 액정(2)의 상태는 변화하지 않는다. Thereafter, the switching element (1) is a limit to the liquid crystal layer (2) is turned on (| V th |), no voltage is applied may be less than, the state of the liquid crystal (2) does not change. 즉, 제어소자(3)는 스위치소자(1)가 온으로 되어 불감대폭 이상의 신호전압을 기입할 때에는 액정층에 인가되는 전압치를 불감대폭 이상으로, 또 스위치소자(1)가 온이라도, 한계치( | V th | ) 미만의 신호전압이 액정(2)에 인가될 경우, 및 스위치소자가 오프일 경우 등에는 불감대폭 미만으로 전압을 제어하는 역할도 가지는 것이다. That is, the control element 3 is even the switching element (1) is the time to write the signal voltage more greatly blocking distance is turned on is greater than or equal to substantially dead voltage value applied to the liquid crystal layer, and switch element 1 is turned on, limit ( | V th |), if the signal voltage is applied to the liquid crystal of less than 2, and the switching element is turned off or the like is one that has a role of controlling the voltage to less than substantially dead. 다음에, 구체적인 회로의 구성예를 근거로 본 실시예의 내용에 대하여 설명한다. Next, description will be made on the contents of this embodiment based on the configuration of the specific circuit. 제2도는 제어소자(3)로서 저항치 R의 저항(5)의 일단을 주사전극배선(5)에 접속한 것이다. Claim is connected to one end of the resistor 5 of resistance R to the scanning electrode wiring 5 as a two-turn control device 3. 이 때, 스위치소자(1) (이하 스위치소자를 박막트랜지스터: TFT로서 설명함)의 온저항을 R on , 오프저항을 R off 라고 하면 R on ＜R＜R off 의 범위내에서 저항(6)의 값 R을 정한다. At this time, the switch elements (1): Speaking of the ON resistance of the thin-film transistor (hereinafter switch elements to be described as a TFT) R on, off the off-resistance R resistor (6) in the range of R on <R <R off It determined the value of R. 제1도의 콘트롤전압 V cont 은 주사전압 V scan 그 자체를 사용한다. A first-degree control voltage V cont uses the scanning voltage V scan itself. 제2도의 회로의 인가전압파형의 일실시예를 제3도에 나타낸다. 2 illustrates one embodiment of a voltage waveform applied in a separate circuit in FIG. 3. 제3도의 파형은 2계조(二階調)표시의 파형이며, V scan1 , V scan2, ‥ 는 주사전극(5)에 인가되는 주사전압, V sig1 는 선택화소에 인가되는 신호전압, V sig2 는 비선택화소에 인가되는 신호전압, V 1c1 ,은 선택 화소의 액정층에 인가되는 전압, V 1c2 는 비선택화소의 액정층에 인가되는 전압이다. Third degree waveform is the waveform of a second tone (二階調) display, V scan1, V scan2, ‥ a signal voltage applied to the selected scanning voltage, V sig1 applied to the scan electrode 5, the pixel, V sig2 a non the signal voltage applied to the selected pixel, V 1c1, the voltage, V 1c2 applied to the liquid crystal layer of the selected pixel is a voltage applied to the liquid crystal layer of the non-selected pixels. 여기서, 설명의 편의상 편의적으로 선택화소로서 액정층에 플러스의 전압이 인가되는 화소, 비선택화소로서 마이너스의 잔압이 인가되는 화소로 하고 있다. Here, and as a convenience for convenience as the pixel, the non-selected pixel is applied with a voltage of the positive to the liquid crystal layer as the selection pixel in the pixel described as being applied to the residual pressure in the negative. 또, 제3도의 신호전압 V sig1 , V sig2 은 각각 선택화소, 비선택화소중에서 가장 인가전압조건이 엄격한 화소의 전압파형을 나타내고 있으며, 이들 조건에 있어서도 표시가 가능하면 어떠한 표시상태에 있어서도 표시가 가능하다. Further, a third-degree signal voltage V sig1, V sig2 are shown also in any display state when display is possible even in each selected pixel, and shows a voltage waveform of the non-selected pixel in the strict the most applied voltage conditions pixel, these conditions It is possible. 또, 액정층(2)에 인가되는 전압에 대해서는 선택화소, 비선택화소 저항(6)의 효과를 보기위해 저항(6)이 접속되어 있지 않은 경우의 파형도 동시에 나타내고 있다. Further, the waveforms shown at the same time when the liquid crystal layer (2) that a resistance (6) is not connected to view the effect of the selection voltage for the pixel, the non-selected pixel resistance (6) to be applied to. 이다. to be. 이와 같은 전압조건 및 전술한 바와 같은 각 저항간의 값을 취함으로써, 액정에 인가되는 전압은 제3도의 V 1c1 , V 1c2 와 같은 파형으로 할 수 있다. By taking the value among the resistance of this voltage and condition described above, the voltage applied to the liquid crystal may be a waveform, such as a third-degree V 1c1, 1c2 V. 즉, 선택화소에 있어서는 TFT소자가 온이며 화소가 주사되었을 때만, 불감대의 상한 즉 한계치 V th (+) 를 전압이 넘어 액정의 광투과상태가 변화하고, 표시정보가 메모리되며, TFT소자(1)가 오프이며 화소가 주사되지 않을때에는 액정에 인가되는 전압의 파고치의 절대치는 한계치( |V th | ) 미만으로 유지되므로, 표시정보도 유지된다. That is, in a selected pixel TFT element is turned on, and only when the pixel is scanned, over the voltage of the dead band upper limit i.e. limit V th (+) light transmitting state is changed in the liquid crystal, and displays the information, and memory, the TFT element (1 ) it is turned off and the absolute value of wave height of the voltage to the liquid crystal when it is not the pixel scanning is the threshold value (| V th |, so kept below), may be kept displayed information. 또, 비선택화소에 있어서도 마찬가지로, TFT소자(1)가 온으로 되어 화소가 주사되었을때만, 불감대의 하한 즉 한계치전압 V th (-) 이하의 전압이 인가되어 표시정보가 메모리된다. In addition, similarly also in the non-selected pixels, TFT elements (1) is turned on only when, the dead band that is the lower limit threshold voltage V th is the pixel scan (-), the display information is applied voltage is less than the memory. 한편, 저항(6)을 접속하지 않을 경우는 TFT소자(1)의 오프저항 R off 을 통한 리크전류 때문에 액정소자의 전압이 화소가 선택되지 않은 기간에, 불감대를 넘어버려 광투과 상태가 변화하여 표시정보를 유지할 수 없다는 것을 알 수 있다. On the other hand, when not connected to a resistor (6) is discarded the voltage of the liquid crystal element over the dead zone, the term pixel is not selected, because the leakage current through the off-resistance R off of the TFT element 1, the light transmitting state is changed and it can be seen that you can not keep the information displayed. 상기 해석은 R on ＜R off 의 가정하에서 행했지만, R on ＜R＜R off의 조건이 성립하도록 저항(6)을 결정하고, 각 저항의 분할에 의한 액정층에의 인가전압을 계산함으로써 구동이 가능하다. The analysis is driven by determining the resistance (6), R on <R condition of the <R off but the line to be satisfied under the assumption of R on <R off, and calculating the voltage applied to the liquid crystal layer due to the division of each resistor this is possible. 본 실시예와 같이, 저항(6)을 부가하고, 강유전성 액정과 액티브 매트릭스를 조합하며, 스위치소자에 요구되는 특성이 대폭 완화된다. As in this embodiment, adding a resistor 6, and a combination of the ferroelectric liquid crystal and an active matrix, the properties required for the switching element is significantly alleviated. 즉, 종래의 액티브매트릭스에서는 액정층에의 기입시간을 결정하는 스위치소자의 온저항 R on 과, 액정층의 전압을 유지하기 위한 스위치 소자의 오프저항 R off ,이 각각의 절대치가 요구되고 있으며, 또 R on 과 R off 와의 비(온·오프비) R off /R on 도 표시화소수가 wmd가함에 따라 10 4 또는 그 이상의 값이 요구되고 있었다. That is, in the conventional active matrix the on-resistance R on and the off-resistance R off, each of the absolute value of the switching element for holding the voltage of the liquid crystal layer of the switching element to determine a writing time of the liquid crystal layer has been required, addition ratio of R on and R off (on-off ratio) had a value of 10 4 or more is required as the number of the display pixels is also R off / R on imposing wmd. 이에 대해, 본 발명의 실시예에서는 인가전압을 결정하는 요인은 R on , R off 와 R와의 관계이며, TFT 등의 스위치소자의 R on ,R off ,에 맞추어서 R을 형성하면 된다. On the other hand, factors that determine the voltage applied to the embodiment of the present invention is the relationship between the R on, R off and R, R a may be formed in conformity with the switching element TFT, such as R on, R off, the. 또한, 액정층의 전압은 이들 저항의 분할비(分割比로 결정하므로 R off /R on 의 비도 그다지 크게 취할 필요는 없다. 또, 종래 액정층의 전압을 유지하기 위해형성하고 있던 스토리지캐패시터도 형성할 필요는 없다. 이와 같이, 본 발명은 액티브매트릭스 형성에 유효하다. Further, the voltage of the liquid crystal layer is also formed of these resistors divide decided ratio (分割比of eliminating the need to take the R off / R on the non-very large. In addition, storage that was formed to the prior maintain the voltage of the liquid crystal layer capacitor need not be. Thus, the present invention is effective for an active matrix form. 즉, 스위치소자가 온일때 파고치의 절대치가 한계치( |V th | ) 이상 [바람직하게는 포화치( |V sat | )이상]인 제2의 전압신호를 인가하여, 액정층의 광투과 상태를 포화상태로 해 두고, 다음에 파고치의 절대치가 한계치( |V th | ) 이상이며 또한 제2의 전압t신호와는 역극성의 제3의 전압신호를 액정에 인가하여, 중간상태로 하는 방법을 취하고 있다. That is, the absolute value of wave height, the switch element on when threshold value (| V th |) or higher [preferably pohwachi (| V sat |) or higher] is generated by applying a voltage signal of the second, saturating the light transmission state of the liquid crystal layer with it in the state, the absolute value of wave height in the following threshold value (| V th |) is at least also the voltage t signal of the second to apply a third voltage signals of opposite polarity to the liquid crystal, taking a method for the intermediate state have. 이 방법은 액정층의 상태의 전력이 일단 마이너스의 펄스에 의해 클리어되므로 중간상태는 신호전압 V sig 의 크기에 대응하여 얻어진다. This is because the state of the liquid crystal layer is once cleared by the power of the negative pulse the intermediate state is obtained in correspondence with the magnitude of the signal voltage V sig. 이 구동방법의 상세한 동작을 다음에 기술한다 제1행째의 화소, 제2행째의 화소,‥‥의 주사전극에 인가되는 주사전압을 V scan1 , V scin2, ‥로 하고, 어떤 열의 신호전극에 인가되는 신호전압을 V sig 로 한다. The detailed operation of the driving method will be described in the following the scanning voltage applied to the pixel, a scan electrode of ‥‥ of the first row of pixels and the second row by V scan1, V scin2, ‥, and applied to any column signal electrodes and the signal voltage V sig in. 또, TFT(1)의 온저항 R on , 저항(6)을 통해 액정층에의 충방전은 신속히 행해지는 것으로 했을 때의 액정층에 인가되는 전압파형은 V 1c1 ,V 0c2 로 된다. In addition, through the on-resistance R on, the resistance 6 of the TFT (1) charging and discharging of the liquid crystal layer are voltage waveforms applied to the liquid crystal layer when that is done quickly becomes V 1c1, 0c2 V.
로 되고, 신호전압 V sig 이 액정층에 인가된다. And a signal voltage V sig is applied to the liquid crystal layer. 이와 같이, 신호전압 V sig 의 레벨을 변조함으로써, 강유전성 액정을 사용한 계조표시를 실현할 수 있다. In this way, by modulating the level of the signal voltage V sig, it is possible to realize a gradation display using a ferroelectric liquid crystal. 제5도는 제1도에 있어서 제어전압 V cont 을 인접하는 화소의 주사전극의 전압으로 한 변형예이다. The fifth example is a variation degrees with the voltage of the scan electrode of the pixel adjacent to the control voltage V cont in Fig. 1. 그 구동파형을 제6도에 나타낸다. It shows the drive waveform in Figure 6. 와 같이 된다. It is as shown. 여기서, 주사전압 V sican1 , V scan2 , … Here, the scanning voltages V sican1, V scan2, ... 을 강유전성액정의 한계치전압 V th (+) 보다 충분히 큰 전압으로 설정함으로써, 액정층에 신호전압이 인가되기 직전에 플러스의 값으로 리세트된다. By setting a sufficiently large voltage than the ferroelectric liquid crystal, the threshold voltage V th (+), is reset to a positive value immediately before the signal voltage is applied to the liquid crystal layer. 그리고, 신호전압을 한계치전압 V th (-) 보다 약간 작은 값으로 변화시킴으로써, 액정층을 중간상태로 제어할 수 있고, 중간조표시가 가능해진다. And, the signal voltage is the threshold voltage V th (-) by changing a value slightly smaller than, and can control the liquid crystal layer in an intermediate state, the halftone display is enabled. 이 경우, 당연히 신호전압을 불감대보다 충분히 큰 진폭으로 설정함으로써 2계조표시도 가능하다. In this case, it is also possible to display two gradations of course, by setting the signal voltage to the dead daeboda sufficiently large amplitude. 제7도는 제1도의 실시예에 있어서, 소자(3)를 저항(6)으로 하고, 콘트론신호 V cont 를 공통전극전압V com 으로 한 구조이다. Claim 7 according to the exemplary turning first-degree for example, a structure for and the element 3 to the resistance (6), Kontron signal V cont to the common electrode voltage V com. 이 경우도, 지금까지 기술한 실시예와 대략 같은 효과가 얻어진다. In this case also, the one embodiment for example, the same effect substantially described so far can be obtained. 지금까지는 콘트롤신호 V cont 를 화소내의 어떤 전압과 겸용한 구조에 대해 기술했지만, 이것을 제8도와같이 전혀 다른 신호원에 접속해도 된다. Until now, although described for the control signal V cont to some voltage and the combined structure in a pixel, this may be connected to a different signal source 8 As shown in Fig. 지금까지의 실시예에서는 액정층의 전압제어용 소자로서 저항을 사용한 예에 대하여 기술했다. In the embodiments so far described with respect to the example using a resistance as the voltage control device of the liquid crystal layer. 이 소자는 저항 이외에도 각종 소자를 사용할 수 있다. The device resistance can be used in addition to the various elements. 제9도는 TFT소자(7)를 강유전성 액정층(2)의 전압제어용 소자로서 사용한 예이다. Claim 9 is turning example using the TFT element 7 as a voltage control element of the ferroelectric liquid crystal layer (2). 이 실시예에서는TFT소자(1) 및 TFT소자(7)도 N채널형을 사용한 회로구성을 나타낸다. In this embodiment, the TFT element 1 and the TFT element 7 is shown a circuit configuration using the N-channel type. 제10도는 제9도의 회로의 구동방법을 나타낸 것이다. Claim 10 degrees shows a driving method of claim 9 degrees circuit. 예를들면 주사전압 V scan2 은 화소 PER off 의 TFT소자(1)의 주사전압과, 화소 PE2의 TFT소자(7)의 주살전압 및 화소 PE2의 액정층의 콘트롤전압 V cg 겸용하고 있다. For example, the scanning voltage V scan2 has combined control voltage V cg of the liquid crystal layer of the pixel PE2 jusal voltage and the TFT element 7 of the scanning voltage of the TFT element 1 and the pixel PER off, the pixel PE2. 기간 t 1 에 있어서는 V scan1 에 의해 PER off 의 TFT소자(7)가 온상태로 되며, 동시에 V scan1 이 TFT소자(1)를 통해 액정층에 인가된다. In the period t 1 is in the ON state the TFT element 7 of the PER off by V scan1, while V scan1 is applied to the liquid crystal layer through the TFT element 1. 다음에, 기간 t 2 에 있어서 화소 PE1의 TFT소자(7)는 V scan1 이 저레벨전압으로 되므로 오프상태로 되며, V scan2 에 의해 TFT소자(1)가 온상태로 된다. Next, the period TFT element 7 of the pixel PE1 according to t 2 is V scan1 is because the low-level voltage and the off state, the TFT element in the on state (1) by V scan2. 이로써, 신호전압 V sig 이 TFT소자(1)를 통해 액정층에 인가된다. Thus, the signal voltage V sig is applied to the liquid crystal layer through the TFT element 1. 여기써, 주사전압 V scan1 , V scan2 , … Here, the scanning voltage V scan1, V scan2, written ... 을 액정층의 한계치전압의 절대치( |V th | ) 보다 충분히 큰 전압으로 설정함으로써, 액정층에 신호전압이 인가되기 전에 한번 플러스의 값의 전압이 인가되어 액정층의 상태가 리세트된다 여기서, 신호전압 V sig 의 전압레벨을 조정함으로써, 중간조표시나 2계조표시의 모두가 가능하다. The absolute value the threshold voltage of the liquid crystal layer (| V th |) by setting a sufficiently large voltage is more, in the liquid crystal layer before applying the signal voltage is applied with a voltage of a positive value of one is set, the state of the liquid crystal layer Li wherein by adjusting the voltage level of the signal voltage V sig, it is possible that all of the halftone display or the two-gradation display. TFT소자의 오프저항 R off 이 충분히 클 경우에는 신호전극(4)에서 신호전압 V sig 의 리크가 없고, 액정층에 불필요한 전압이 인가되지 않으므로 특히 문제는 생기지 않는다. When the TFT element off-resistance R off is large enough, there is no leakage of the signal voltage V sig in the signal electrode 4, unnecessary, because the voltage to the liquid crystal layer is applied in particular problems do not occur. 그러나, TFT소자의 오프저항 R off 이 충분하지 않을 경우는 신호전압의 리크를 작게 억제하기 위해, TFT소자(1)외 오프저항 R off 과 TFT소자(7)의 오프저항 R off7 과의 사이에 R off1 ＞R off7 로 되도록 TFT소자를 설계하지 않으면 안된다. However, TFT when off-resistance R off of the device is not sufficient in order to suppress the leakage of the signal voltage, the TFT element (1) between the between the off-resistance R off7 other off-resistance R off and the TFT element 7 R off1> should unless design the TFT element so that the R off7. 이를 위해서는, TFT소자형상, 즉 채널길이 L와 채널폭 W을 조정하고, 오프저항 R off 을 변화시킬 필요가 있다. To do this, TFT element shapes, that is, it is necessary to adjust the channel length L and channel width W, and the change in the off-resistance R off. 또는, 어느 1개의 TFT소자의 채널부에 이온주입 등의 방법에 의해 불순물을 도핑하고, TFT소자의 한계치전압V th 을 변화시켜서, 동작점에서의 오프저항 R off 을 변화시키는 방법 등을 들 수 있다. 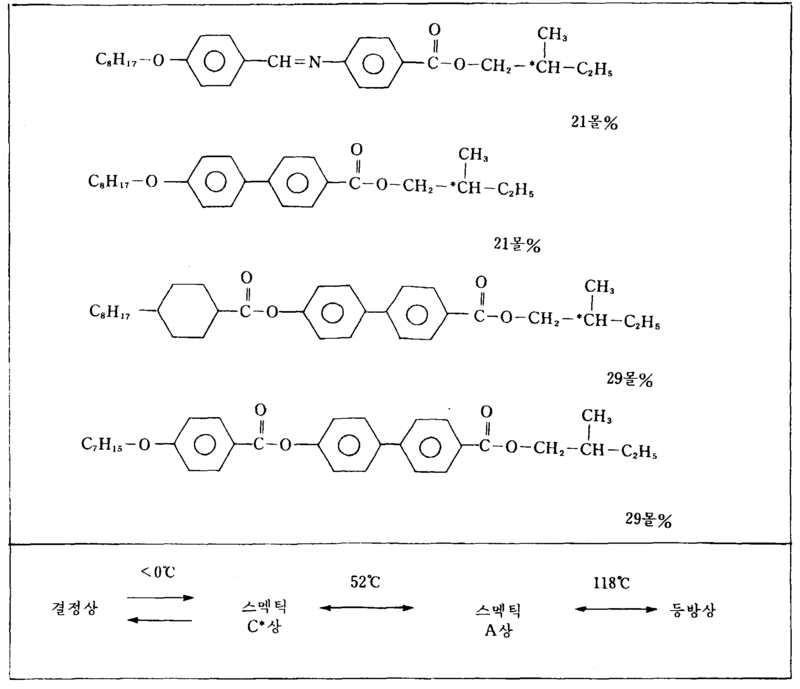 Alternatively, it doped with an impurity by a process such as ion implantation in the channel portion of either one TFT element and, TFT by element changes the threshold voltage V th of the can and a method for changing the R off off resistance at the operating point have. 제11도는 TFT소자(1)의 주사전극에 콘트롤신호를 접속하고 TFT소자(7)의 주사전압은 이 화소의 1행앞(필요에 따라서는 복수행 앞)의 주사전극에 접속한 구조이다. The scanning voltage of the TFT 11 to turn the device (1) connected to the TFT element 7 of the control signal to the scan electrode of the structure is connected to a scanning electrode of one of the pixel haengap (front therefore has multiple lines needed). 구동방법은 제12도와 같이 예를들면 V scan2 는 화소 PE1의 액정층을 마이너스의 전압에 의해 리세트하는 역할과 다음의 기간에 TFT소자(1)를 주사하여 온상태로 하는 역할을 갖고 있다. The driving method is, for example, as a twelfth help V scan2 has the role of the state turned on to scan the TFT element (1) the role and the period of the reset by the liquid crystal layer of the pixel PE1 to the negative voltage. 지금까지의 실시예에서는 1화소내에 형성하는 2개의 TPF소자는 모두 N채널구조로 하였으나, 이것을 P채널 구조의 TFT와 N채널구조의 TFT를 조합한 구성이라도 된다. In the above embodiments so the two TPF device forming in one pixel but all the N-channel structure, it is a configuration in a combination of the TFT of the TFT and the N-channel structure of the P-channel structure. 제13도는 양 채널의 소자를 조압했을때의 회로의 실시예이다. A first embodiment of a circuit when the pressure regulating element 13 of the two channel leads. TFT소자(1)를 N채널, TFT소자(7)를 P채널의 구성으로 해도, 또 그 역의 조합으로 해도 동작가능하다. Even if the TFT element 1, the N channel TFT elements 7 in the configuration of the P-channel, and may be a combination of this station is operable. 제14도는 TFT소자(1)를 N채널, TFT소자(T)를 P채널로 한 경우의 구동파형, 또 제15도는 TFT소자(1)를 P채널, TFT소자(7)를 N채널로 한 경우의 구동파형을 나타낸다. 14 a to turn the TFT element (1) the N channel, the TFT element TFT element 1 is a driving waveform, and turning part 15 of the case of the (T) to the P channel of the P-channel, the TFT element 7 is of an N-channel If shows the drive waveform. 제16도에 강유전성 액정을 사용한 액티브내트릭스 디스플레이의 부분단면 개략구조를 나타낸다. The shows a partial cross-sectional schematic of a structure within the active matrix display using a ferroelectric liquid crystal 16 in Fig. 기판(8)은 예를들면 바륨붕규산유리나 석영유리 등의 투명기판이며, 그 위에 다결정실리콘막이나 재결정화실리콘막등의 반도체박막(12), 절연막(13)을 형성하고, 공지의 제조프로세스로 게이트전극(15), 드레인전극(14), 투명전극(10) 등을 형성하여, TFT소자를 제작했다. Substrate 8, for example, barium borosilicate, and a transparent substrate such as glass or quartz glass, and forming a semiconductor thin film 12, insulating film 13 such as polycrystalline silicon film or recrystallized silicon film thereon, and in the production of known processes to form a gate electrode 15, drain electrode 14, the transparent electrode 10, etc., to prepare a TFT element. 그후, TFT상에 예를들면 유기물의 박막인 유기도포막(16)을 스피너도포 등에 의해 형성하고, TFT부 이외의 부분을 제거하였다. Then, for example, an organic thin film of the organic material also formed by the indusium 16, spinner coating or the like, to remove the portion other than the TFT portion on the TFT. 그 위에 유리기판을 적층하였다. A glass substrate was laminated thereon. 이와 같은 구조로 함으로써, 셀갭(cell gap)은 TFT의 높이와 유기도포막(16)에 의해 결정되며, 2㎛정도 또는 그 이외의 갭을 표시부 전역에 걸쳐서 형성할 수 있다. By in this structure, the cell gap (cell gap) is the height of the organic TFT determined by the indusium 16, it is possible to form the 2㎛ degree or the other of the gap over the entire display. 여기서, 앞에 기술한 성분의 액정을 봉입하고 강유전성 액정과 액티브매트릭스를 적층한 디스플레이를 형성할 수 있다. Here, the liquid crystal filled in the front component technology and can be formed by laminating a display for a ferroelectric liquid crystal and an active matrix. 본 발명에 의하면, 강유전성 액정의 특성을 이용하여 특성이 불충분한 TFT소자 등의 스위치소자를 사용해도 양호한 구동이 가능해진다. According to the present invention, may use a switching element, such as using the characteristic of the ferroelectric liquid crystal property is insufficient TFT device it is possible to drive preferred. 또한, TFT소자 등의 스위치소자의 제어전극에 인가하는 주사전압을 이용하여. Further, using a scanning voltage applied to the control electrode of the switching element such as TFT devices. 액정층을 미리 포화상태로 해 두고, 그후 신호전압에 의해 중간상태를 실현하므로, 재현성이 양호한 중간조표시를 얻을 수 있다. To leave the liquid crystal layer is pre-saturated state, so the intermediate state realized by a signal voltage thereafter, the reproducibility can be obtained a good halftone display. 제1항에 있어서, 상기 제2의 전압신호는 파고치의 절대치가 광투과상태의 전압의존이 실질적으로 없어지는 포화치( | sat | ) 이상의 전압신호인 것을 특징으로 하는 액정소자의 구동방법. The method of claim 1, wherein the voltage signal of the second is the absolute value of wave height of the voltage-dependent light transmissive state is substantially eliminated as is pohwachi method of driving a liquid crystal element, characterized in that at least the voltage signal (| | sat). 제1항에 있어서, 상기 강유전성 액정에 인가되는 전압의 평균치가 실질적으로 0인 것을 특징으로 하는 액정소자의 구동방법. The method of claim 1, wherein the driving method of the liquid crystal element, characterized in that the average value of the voltage applied to the ferroelectric liquid crystal is substantially zero. 제1항에 있어서, 상기 제1의 전압신호를 상기 강유전성 액정에 인가하는 시간은 상기 제2의 전압신호를 상기 강유전성 액정에 인가하는 시간보다 긴 것을 특징으로 하는 액정소자의 구동방법. The method of claim 1, wherein the time for applying a voltage signal from the first to the ferroelectric liquid crystal, a driving method of the liquid crystal element, characterized in that is longer than the time to be applied to the ferroelectric liquid crystal, the voltage signal of the second. 제1항에 있어서, 상기 제1의 전압신호 및 상기 제2의 전압신호는 펄스전압신호인 것을 특징으로 하는 액정소자의 구동방법. The method of claim 1, wherein the voltage signal and a voltage signal of the second of the first driving method of the liquid crystal element, characterized in that a pulse voltage signal. 표시전극간에 쌍안정성을 가진 강유전성 액정을 협지하여 이루어지고, 복수의 주사전극과 복수의 신호전극과의 각각의 교점에 스위치소자를 설치하고, 상기 각 스위치소자와 상기 표시전극의 한쪽과의 접속점에 제어소자를 설치한 액정소자의 구동방법에 있어서, 상기 스위치소자가 오프일때 파고치의 절대치가 상기 강유전성 액정의 한계치( |V th | ) 미만으로 유지되는 전압을 상기 강유전성 액정에 인가하고, 상기 스위치소자가 온일때 파고치의 절대치가 상기 한계치 ( |V th | ) 미만인 제1의 전압신호를 상기 강유전성 액정에 인가하여, 광투과상태를 유지시키고, 상기 스위치소자가 온일때 파고치의 절대치가 상기 한계치 ( |V th | )이상인 소정의 값의 제2의 전압신호를 상기 강유전성 액정에 인가하여, 광투과상태를 소정의 상태로 하고, 파고치의 절 Is made by sandwiching a ferroelectric liquid crystal having the bistability between the display electrodes, the connection point of the plurality of scan electrodes and a plurality of a switch element in each intersection of the signal electrode, each of the switching elements and one end of the display electrode in the driving method of the liquid crystal device is installed the control device, the absolute value of the switch element off when digging limit value of the ferroelectric liquid crystal (| V th |) is applied a voltage which is kept below the ferroelectric liquid crystal, and the switching element wherein the threshold value is absolute value, coming on when (| V th |) to apply a voltage signal is less than the first to the ferroelectric liquid crystal, maintaining a light-transmitting state, and, wherein the threshold absolute value of a wave height when the switch element turned on (| v th |) at least section by applying a voltage value of the signal of the second predetermined value in the ferroelectric liquid crystal, and a light-transmitting state to a desired state, the peak 대치가 상기 한계치( |V th | ) 이상이고, 또한 상기 제2의 전압신호와는 역극성(逆極性)의 제3의 전압신호를 상기 강유전성 액정에 인가하여, 광투과상태를 변화시키는 단계로 이루어지는 것을 특징으로 하는 액정소자의 구동방법. A step of not more than, and also applied to the ferroelectric liquid crystal, wherein a voltage signal of a third of the opposite polarity (逆極性) and the voltage signal at the second, changing the light transmitting state replacing said threshold value (| | V th) method of driving a liquid crystal device which comprises. 제6항에 있어서, 상기 제2의 전압신호는 파고치의 절대치가 광투과상태의 전압의존이 실질적으로 없어지는 포화치(| sat |) 이상의 전압신호인 것을 특징으로 하는 액정소자의 구동방법. The method of claim 6, wherein the voltage signal of the second is the absolute value of wave height of the voltage-dependent light transmissive state is substantially eliminated as is pohwachi method of driving a liquid crystal element, characterized in that at least the voltage signal (| | sat). 제6항에 있어서, 상기 강유전성 액정에 인가되는 전압의 평균치가 실질적으로 0인 것을 특징으로 하는 액정소자의 구동방법. 7. The method of claim 6, the driving method of the liquid crystal element, characterized in that the average value of the voltage applied to the ferroelectric liquid crystal is substantially zero. 제6항에 있어서, 상기 제1의 전압신호를 상기 강유전성 액정에 인가하는 시간은 상기 제2의 전압신호 및 상기 제3의 전압신호를 상기 강유전성 액정의 인가하는 시간보다 긴 것을 특징으로 하는 액정소자의 구동방법. The method of claim 6, wherein the time for applying a voltage signal from the first to the ferroelectric liquid crystal is a liquid crystal element, characterized in that is longer than the time of application of the ferroelectric liquid crystal, a voltage signal and a voltage signal of the third of the second a drive method. 제6항에 있어서, 상기 제1의 전압신호, 상기 제2의 전압신호 및 상기 제3의 전압신호는 펄스전압신호인 것을 특징으로 하는 액정소자의 구동방법. The method of claim 6, wherein the voltage signal of the first voltage signal and the second voltage signal and the third of the driving method of the liquid crystal element, characterized in that a pulse voltage signal. 표시전극간에 쌍안정성을 가진 강유전성 액정을 협지하여 이루어지는 액정소자에 있어서, 복수의 주사전극과 복수의 신호전극과의 각각의 교점에 스위치소자를 설치하고. In the liquid crystal device formed by sandwiching a ferroelectric liquid crystal having the bistability between the display electrodes, and providing a plurality of switch elements in each intersection of the scanning electrodes and plural signal electrodes. 상기 각 스위치 소자와 앙기 표시전극의 한쪽과의 접속점에, 상기 스위치소자가 오프일때 상기 강유전성 액정에 인가되는 전압의 파고치의 절대치가 상기 강유전성 액정의 한계치( |V th | ) 미만으로 유지되는 제어소자를 설치하고, 상기 스위치소자는 제어단자가 상기 주사전극에, 한쪽 주단자가 상기 신호전극에, 다른 쪽 주단자가 상기 표시전극의 한쪽에 접속되는 3단자스위치소자인 것을 특징으로 하는 액정소자. The connection point to the each of the switching elements and anggi show the electrode side, the switch element off when the absolute value of wave height of the voltage applied to the ferroelectric liquid limit of the ferroelectric liquid crystal control devices are held to be less than (| | V th) installation, and the liquid crystal element to the switching element includes a control terminal to the scan electrode, wherein the one peripheral edge self three-terminal switch element in the signal electrode, and the other peripheral edge self-connected to one of the display electrode a. 제11항에 있어서, 상기 3단자스위치소자는 박막트랜지스터인 것을 특징으로 하는 액정소자. 12. The method of claim 11, wherein the three-terminal switch elements are liquid crystal elements, characterized in that the thin film transistor. 표시전극간에 쌍안정성을 가진 강유전성 액정을 협지하여 이루어지는 액정소자에 있어서, 복수의 주사전극과 곽수의 신호전극과의 각각의 교점에 스위치소자를 설치하고, 상기 각 스위치소자와 상기 표시전극의 한쪽과의 접속점에, 상기 스위치소자가 오프일때 상기 강유전성 액정에 인가되는 전압의 파고치의 절대치가 상기 강유전성 액정의 한계치( |V th | ) 미만으로 유지되는 제어소자를 설치하고, 상기 제어소자는 상기 스위치소자와 상기 표시전극의 한쪽과의 접속점과, 상기 스위치소자에 인접하는 스위치소자에 접속되는 다른 주사전극과의 사이에 설치되는 것을 특징으로 하는 액정소자. In the liquid crystal device formed by sandwiching a ferroelectric liquid crystal having the bistability between the display electrodes, providing a plurality of switch elements in each intersection of the signal electrode of the scan electrode and gwaksu, and one side of each of the switching elements and the display electrode and in the connection point, the switch element off when the absolute value of wave height of the voltage applied to the ferroelectric liquid limit of the ferroelectric liquid crystal (| V th |) to install the control element is kept below, and wherein the control element is the switching element and a liquid crystal element characterized in that arranged between the other scanning electrodes to be connected with the connection point to the one end of the display electrode, the switch element adjacent to the switch element. 표시전극간에 쌍안정성을 가진 강유전성 액정을 협지하여 이루어지는 액정소장에 있어서, 복수의 주사전극과 복수의 신호전극과의 각각의 교점에 스위치소자를 설치하고. In the liquid crystal director formed by sandwiching a ferroelectric liquid crystal having the bistability between the display electrodes, and providing a plurality of switch elements in each intersection of the scanning electrodes and plural signal electrodes. 상기 각 스위치소자와 상기 표시전극의 한쪽과의 접속점에, 상기 스위치소자가 오프일때 상기 강유전성 액정에 인가되는 전압의 파고치의 절대치가 상기 강유전정 액정의 한계치( |V th | ) 미만으로 유지되는 제어소자를 설치하고, 상기 제어소자는 3단자스위치소자인 것을 특징으로 하는 액정소자. Wherein each switching element with the connection point of the one side and at the display electrode, the switch element off when the absolute value of wave height of the voltage applied to the ferroelectric liquid limit of the ferroelectric pruning liquid crystal control is maintained to be less than (| | V th) installing the device, wherein the control device is a liquid crystal element, characterized in that three-terminal switching element. NL8700627A (en) * 1987-03-17 1988-10-17 Philips Nv A method for controlling a liquid crystal display device and associated display device. NL8701420A (en) * 1987-06-18 1989-01-16 Philips Nv A display device and a method for controlling such a display device. NL8703040A (en) * 1987-12-16 1989-07-17 Philips Nv A method for driving a passive ferro-electric liquid crystal display device. NL8703085A (en) * 1987-12-21 1989-07-17 Philips Nv A method for controlling a display device. NL8802155A (en) * 1988-09-01 1990-04-02 Philips Nv A display device.